The Mayor of Bruqin, Lawyer Nafiz Barakat brings IWPS volunteers a Palestinian newspaper and two maps. Listed in the obituary section of the newspaper is a declaration of intention for the Bruchin settlement expansion and a call to Palestinian farmers, who own the land, to speak out in a court located in the Bet El illegal settlement if they contest the growing incursion on their property. 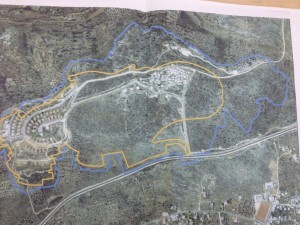 They will be annexing 700 more dunum to make passage for the illegal construction of 550 new settler homes. 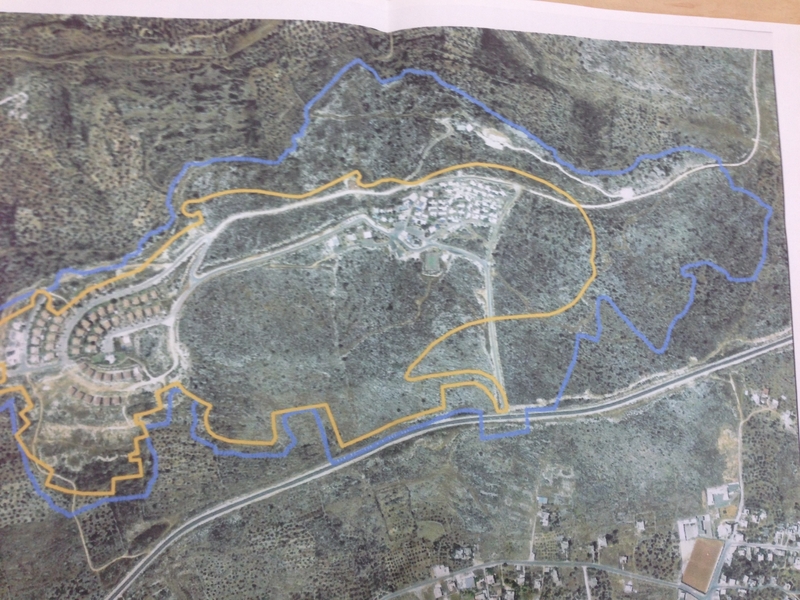 The maps outline the intended expansion- and although there is empty land in every direction, they have chosen to expand the settlement to within a single meter of the Palestinian girls’ school. Another issue lies in the fact that the court’s communications, both spoken and on paper, is in Hebrew and no translation is provided. Yet another issue is that the illegal expansion plan is actually 900 dunum; not the 700 dunum posted in the declaration. And finally, the court indicates that the farmers have 45 days to protest the order- but the declaration has been posted past the 45 day period Palestinian land owners had to take legal action to assert their land rights. 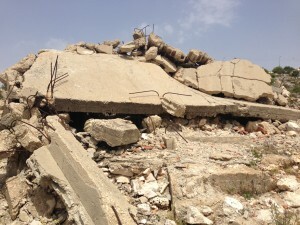 A home demolished in 2006 still sits in ruins in the village of Bruqin. 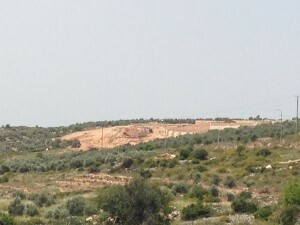 Issues of settlement expansion and the ensuing home demolitions- there are currently over 100 demolition orders in Bruqin- including homes and a mosque- are just one of the many antagonisms the village, which is within just 200 meters of an Israeli army encampment and the nearby Bruchin settlement, faces. 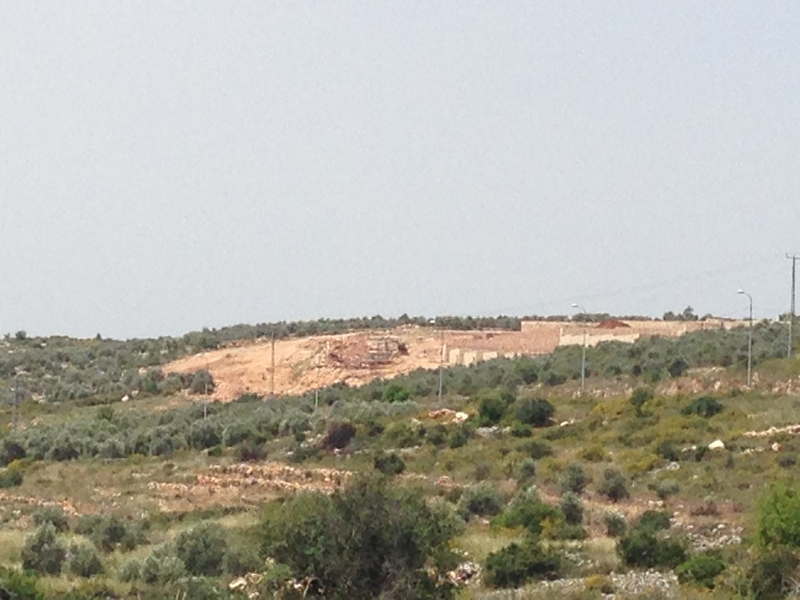 Bulldozers clear the land where 550 illegal settler homes are to be constructed. A map indicating intended expansion of the illegal Bruchin settlement. Yellow marks existing while purple marks expansion. This is Bruqin, spring 2015; and Mayor Barakat updates on an agricultural threat and human safety issue growing in the village that IWPS reported on last year; http://iwps.info/2014/09/30/a-bleak-future-for-bruqin-and-kufr-al-dik/. Wild pigs, believed to be released in the Palestinian village by settlers of the illegal Bruchin settlement bloc, began to plague their crops and present physical dangers for Palestinians in Bruqin village, and while the problem of wild pigs roaming the village continues, a bigger concern and possibly more dangerous one has mysteriously sprung up. “They have unleashed another animal into the village I believe, an animal we have never seen before but which has, thus far, sickened several Bruqin residents.” The rock badger, an animal whose distribution originates from Israel and several other Arab countries, though Palestine has not been listed as one of them, has been spotted in the village. The badgers, members of the hyrax genus, are attractions for sandflies and mosquitoes- who in this region, cause an illness known as Leishmaniasis. The illness affects the skin and ultimately the liver and spleen. “One of the women who got sick from the flies has had 52 treatment injections but the ulcers on her face are still there. She is still suffering from this.” Barakat’s concern for the woman’s condition is clear. As mayor, he is taking steps, through the Health Ministry, to arrange for spraying the land as a means to control the spread of the illness through extermination. IWPS volunteers are invited to the home of a man whose land borders Area C. ‘Bruqin village, with a population of about 4,000, is located in the zones B and C. Area C covers 61% of the West Bank while areas A and B make up the remaining 39%.’ The Palestinian elder describes in agonizing detail the night raids where he and his in-laws were held at gunpoint by occupation forces, the demolition of his cousin’s home and small brick manufacturing factory along with the multiple arrests of his 14 year old son, mentally disabled from birth and suffering from subsequent psychological issues. “My son is sick. Within one year, they arrested him three times. During one arrest, they shackled him as he shook and cried…. he was terrified.” In the first arrest, when the arresting occupation soldiers realized he was mentally ill- and that they had absolutely no evidence against him for the charge of allegedly throwing stones at illegal settlers- they dumped him off on a road in the middle of the night where he wandered to a gas station and found a man who called his father to come and get him. As if this display of inhumane cruelty weren’t enough; during another arrest, occupation soldiers called his father to inform that the release of his son would cost 2,000 shekels. “I told him I only had 1,000 shekels and they said, ‘that will do.’ They were out in the street with him when I got there and paid the fee to release him. ” When the family showed up in Salem military court in Jenin district on the date the Israeli soldiers instructed upon his release, the court had no record of his name and no such court hearing existed. They also had no receipt for the 1,000 shekels his father paid them. This seeming extortion is just another item on a long list of antagonisms and imposed social struggles the town faces such as water shortage during summer months as the water is diverted to the surrounding three settlements and redistributed to the Palestinians at a ratio of 1 part per 8 parts that the illegal settlers get. What ensues is the taking of turns of Bruqin villagers to water their farm land and for personal usage during the months of May through October to accommodate the shortage.